The oxidation of several largely austenitic Fe-Cr-Ni alloys in 1 atm oxygen at 800–1200°C has been studied thermogravimetrically, metallographically, and in detail by electron probe micro analysis. Fe-Cr-Ni alloys of this type are protected by Cr2O3-healed scale, which thickens slower than on the corresponding binary Fe-Cr and Ni-Cr alloys, presumably because nickel and iron ions dope the Cr2O3 more effectively together than singly and/or because the alloy composition and ability to absorb cation vacancies are such as to produce a smaller vacancy activity gradient or level in the scale, or voids within it. The scale adhesion, as on Ni-Cr alloys, is generally good after long times, at least partly due to the convoluted alloy-oxide interface, in some cases to large intergranular Cr2O3-rich stringers, and possibly to the general specimen mechanical properties. Nonprotective stratified scale development is relatively unusual and often produces nickel-rich, alloy-particle-containing nodules, as on Fe-Ni alloys. 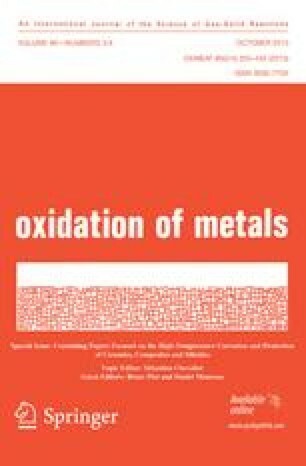 Careful selection of ternary and more complex alloys with appropriate alloy interdiffusion coefficients and oxygen solubilities and diffusivities should permit development of materials with the best compromise between ease of Cr2O3 establishment, avoidance of breakaway, and readiness of scale healing.